Microsoft Office programs offer the Format Painter button that copies formatting from one object and applies its style to another or to many other objects. It leaves the content alone. Format Painter can be used on a variety of content: text and paragraphs, table and spreadsheet cells, shapes and slides. Select the text or object whose formatting you like. 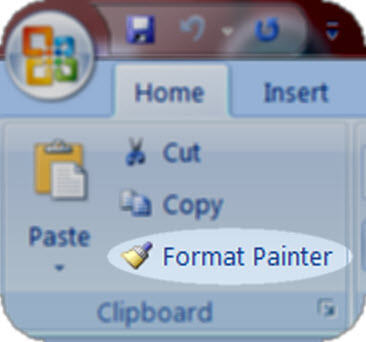 On the Home toolbar, single click the Format Painter. Click on or select the text or object you want to reformat. Ta da! To copy paragraph formatting (such as alignment, indentation, spacing, etc.) in addition to font formatting, make sure to include selecting the hard return that ends the paragraph. To apply the same formatting to multiple objects (for example, several headings throughout a paper), double-click the Format Painter. Select all of the destinations for the formatting; then click the Format Painter again to turn it off.